Great Places to Visit during your stay in San Jose! San Jose, Costa Rica has many museums that are worth visiting and seeing. Some museums illuminate what life was like in Costa Rica in ancient times while others spotlight current Costa Rican culture. The Top 5 museums in San Jose include the Museo National de Costa Rica, the Gold Museum, the Jade Museum, the Museum of Costa Rican art, and the Children’s Museum. The Museo Nacional de Costa Rica is located in the former Bellavista Military Barracks, an old fort where bullet holes can still be seen on the building. This makes el museo nacional a living piece of civil war history. The museum has exhibits highlighting Costa Rican natural history, anthropology, archaeology, and history. There is also a butterfly garden located in the museum. One exhibit delineates Costa Rican history in a timeline from Pre-Colombian times to the present. Another interesting exhibit shows how they transformed the fort into a museum. The Gold Museum Costa Rica holds one of the largest collections of Pre-Columbian gold in all of the Americas. The museum also shows how gold is transformed into objects of beauty and function in the gold process. The exhibits also reveal what life was like for the indigenous people during Pre-Columbian times and houses many other Pre-Columbian artifacts. 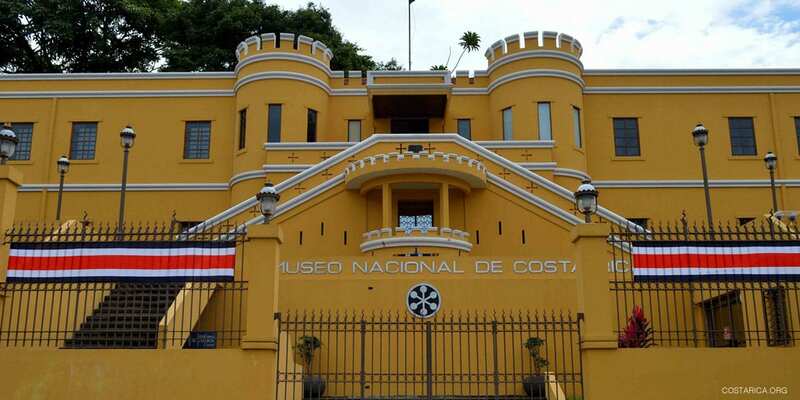 Located in the building is also the Numismatic museum where you see the history of currency in Costa Rica. There is also an exhibit that features displays of rare currency dating back hundreds of years. The Jade Museum Costa Rica holds the world’s largest collection of Pre-Colombian Jade. There are over 7,000 pieces of Jade in the museum’s collection. The Jade Museum shows the process involved in creating jade pieces and has displays explaining the importance of jade in ancient Costa Rican life. The Museum of Costa Rican Art. Located in beautiful La Sabana Park and features art from renowned Costa Rican and international artists. The building is architecturally unique as it was the former home of Costa Rica’s international airport and Sabana Park is a lovely place for a picnic or a stroll. Try some of the fresh tropical fruits available from vendors in the Park! The museum’s structure was the former international airport of Costa Rica. The Costa Rican Center of Science and Culture include the Children’s Museum, National Auditorium, also the National Gallery. This is a perfect destination for a family jaunt. The museum contains world-class galleries, hands-on exhibits, and many interesting things for both adults and children to see. The exhibits explore technology, science, recycling, and culture. There are also historical exhibits and one that focuses on life in the former prison. Visit any number of these great points of interest.